But it was not just his eccentricities and his wit that made Bob Addy so memorable. For one thing, he was one of the best players of his era in spite of being very late to take up baseball. In addition, he played the game with a spirit of reckless abandon that led teammate George Bird to call him “about the toughest fellow I ever saw. He would go after anything, any way, and his hands were broken and battered out of shape.”9 Finally, Bob Addy was the first Canadian major leaguer and, unlike many early Canadian-born players, he had actually grown up there. When and where Bob Addy was born has long been a disputed issue, with most sources indicating that he was born in Rochester, New York, in 1845. Addy seems to have given this information out in his later years, but there is overwhelming evidence that he was actually born in Canada. He was living in Port Hope, Ontario, when the 1861 Canadian census was taken – his birthplace was listed as Upper Canada (Ontario), and his age was given as 19. Nine years later, he was living in Rockford with many of his baseball teammates and was reported to have been born in Canada around 1842. It was not until the 1880 census that he was first listed as being born in New York. Exactly when he was born remains unclear. Late in life he began claiming an 1845 year of birth, but the evidence suggests otherwise. His tombstone has 1838, which would be very intriguing if true, but the source of this information is not known. The 1860 and 1870 censuses suggest that he was born around 1842, and that seems most plausible. Bob Addy reportedly “belonged to several cricket clubs in the Dominion,” but any details are lost to history.13 Nor is much known about his early years except that he was born shortly after his parents emigrated from Ireland and that his father, whose name appears to have been James, had died by 1857. It becomes easier to follow Addy’s trail in 1861, when he appears in Port Hope on the Canadian census, already working in his lifelong profession as a tinsmith. Listed with him are his mother Ellen (age 44, born Ireland), his younger brother James (17, born Upper Canada, a saddler), and his older brother George (25, born Ireland, a clerk). George’s presence in Port Hope is a bit odd, since he had been listed in Ogle County, Illinois, on the 1860 U.S. census and got married in that county in February of 1861. So perhaps he was still in the process of relocating to the United States. Addy was soon offered a place on the Forest City Club and a job at a Rockford hardware store, both of which he accepted. It was a coup for the Forest Citys and the start of the club’s highly successful policy of recruiting players from the surrounding countryside. The Forest Citys made a gradual transition from amateurism to professionalism over the next three years, a process that entailed the replacement of several starters. Only three players remained fixtures in the club’s lineup: Spalding, Addy, and a young protégé of Addy’s named Roscoe Barnes. Spalding and Barnes went on to become superstars in the first major league, the National Association (1871-1875). Addy is much less remembered today, in large part because his National Association statistics are not on a par with Spalding’s and Barnes’s gaudy numbers. But those who saw him play, especially during his years in Rockford, believed that he too was a star of the first magnitude. Such judgments do not mean much when they are not supported by the statistical record, and a superficial look at Addy’s National Association and National League statistics suggests that he was a run-of-the mill major leaguer. But such a conclusion can only be drawn by overlooking the key fact that by the time those leagues were formed, Bob Addy was already on the downside of his career – exactly how far past his prime he was again depends on the knotty issue of his correct age. 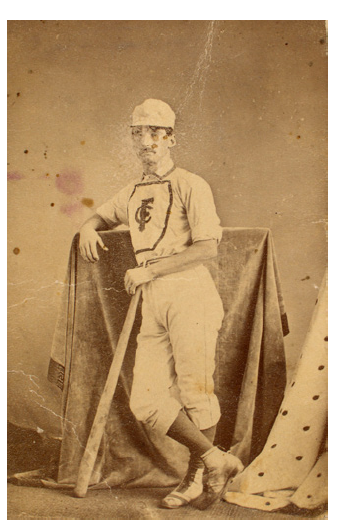 While we have less extensive statistics from the 1869 and 1870 seasons, when Addy was in his prime, the available records show that he deserved to be regarded as one of the game’s best players. These two glorious seasons almost never happened. As the start of the 1869 season approached, Addy was talking seriously about heading west to “seek his fortune.”25 But in the end he decided to stay in Rockford for another summer, and he enjoyed a season that has to be ranked as the best of his career, since his five-plus hits per game were compiled while making the switch to the game’s most demanding defensive position. The 1869 season is remembered as the undefeated season of the “Red Stockings” of Cincinnati, but it was also a memorable campaign for the Forest Citys. The Rockford club, although still ostensibly amateur, lost only four games all season – all of them to the openly professional Red Stockings. In one of those contests, the Forest Citys came within two outs of pulling off an upset that would have changed baseball history. Led by Addy’s heroics, the Forest Citys were clinging to a 14-12 lead as the game went to the bottom of the ninth inning. But after the first batter was retired, the Red Stockings mounted a three-run rally to preserve their undefeated season. Bob Addy left Rockford at the conclusion of the 1869 season and announced that he would not be returning. But “the week before the election Bob was back again, swearing to locate permanently, and establishing himself in a tinning and jobbing shop opposite the court house.”30 He returned to second base in 1870 as the Forest Citys completed the transition to open professionalism. The club compiled a 42-13-1 record during a prolonged schedule that included Addy’s previously mentioned return to Canada and that climaxed with an October 15 victory over the Red Stockings. On one of the club’s few off-days, on August 13, Addy found time to get married in Rockford. The winter following the 1870 season saw the birth of the National Association and the departure of three club stalwarts, as Spalding, Barnes, and Cone all chose to sign with Boston. The Forest Citys nonetheless decided to enter the new league, and Addy thus became the club’s longest-tenured member (with the exception of Al Barker, who played sparingly). A much younger lineup resulted, with Addy the grizzled veteran among a group of newcomers who included the nineteen-year-old Cap Anson. The Great Chicago Fire put a temporary halt to professional baseball in the region then known as the West and a permanent end to the brilliant career of the Forest City Club of Rockford. For a while, it appeared it would also mark the end of Bob Addy’s career, as the newlywed elected to remain in Rockford and pursue business. Business concerns were said to have been the reason for his return to Rockford, but a more personal matter may have been the determining factor. Bob and Ida Addy’s only son was a boy named George. Following in the family tradition, George would later give contradictory information about his date of birth, but it appears most likely that he was born on August 1, 1873. Addy spent the 1874 season in Hartford, his last year as a regular infielder. At season’s end, it was announced that he planned to organize a new professional club in Springfield, Massachusetts. But he was slow to sign players, prompting speculation that he would only enlist the services of a pitcher and catcher and would cover the rest of the field by himself.36 Eventually plans for the Springfield Club were abandoned, and Addy instead returned to the White Stockings of Philadelphia where, according to one rather far-fetched retrospective article, he pretty much ended up fulfilling the prediction that he would have to cover the entire field. After the 1875 season the National League was formed as a successor to the National Association. The main motive for this coup was that it legitimized Chicago’s William Hulbert’s signing of Boston’s four best players, the so-called “Big Four” of Spalding, Barnes, Jim “Deacon” White, and Cal McVey. From Rockford’s perspective, the development was most ironic: five years earlier, the National Association had been launched when Boston had signed Spalding and Barnes, and the two young men who had grown up in Rockford had led Boston to four straight pennants. So their return to Illinois seemed a case of turn-about being fair play. But as the Chicago Tribune was quick to point out, the Times had done an “injustice to Addy in classing him with such a gang.”40 Like many of his teammates, Addy was owed money at the end of the 1875 season and was anxious to leave Philadelphia.41 Meanwhile, Spalding had been named captain of the new club in Chicago and Anson had been added to the club’s contingent of Forest City alumni. Spalding soon offered Addy a spot on the team and the two men who had already been teammates in Rockford and Boston were reunited for the third time. In September, with the pennant within sight, Boston came to town for a game that featured numerous players from the old Red Stockings-Forest City rivalry. Addy, Spalding, and Barnes all took the field for the home side, while the visitors included Andy Leonard and both Wright brothers. For good measure the umpire was Fred Cone, the third player who had left the Forest Citys after the 1870 season to play for Boston. But Addy soon gave up the skating rink business and finally did what he had so often talked of doing by heading out west, where he remained for the rest of his life. He brought along his young son George but not his wife Ida. She was still alive according to Bob’s listing the 1880 census, but otherwise she remains a mysterious figure. Her marriage record gives her name as Ida Belle Seeley, while her son’s marriage record says that it was Ida Enose, but she cannot be identified under either name. Nor is anything known about what became of her after Bob moved west. Even after permanently settling in the West, Addy’s doings continued to be chronicled in the eastern press. In 1879 he was reported to be playing baseball in Salt Lake City for a team known as the Gentile Club.58 Seven years later, a claim that he had become a Mormon with twelve wives was widely reprinted.59 Other unfounded reports had him in Oregon and California. The reality seems to have been more prosaic. By the time of the 1880 census, he was living in Evanston, Wyoming, and he was still there at the end of the decade. Around 1891, he moved to Pocatello, Idaho, where he opened a hardware store and, on the first day of 1892, was remarried to a much younger woman named Louise Emma Clark. The marriage produced one child, a daughter named Ellen Louise, who was born on December 1, 1897. Coverage of the Forest City Club is usually based upon A. G. Spalding’s fascinating but unreliable America’s National Game: Historic Facts Concerning the Beginning, Evolution, Development, and Popularity of Base Ball, with Personal Reminiscences of Its Vicissitudes, Its Victories, and Its Votaries (1910) (reprint, Lincoln: University of Nebraska Press, 1992). I have instead relied primarily on two sources: an extraordinary 44-part history of the club that was written by Horace E. Buker and published serially in the Rockford Republic in 1922 and a five-part series by John Molyneaux that appeared in Nuggets of History, a publication of the Rockford Historical Society (“The Sinnissippi Base Ball Club,” 43: 1 (March 2005); “The Forest City Base Ball Club: The Amateur Years,” 45: 1 (March 2007); “No Longer Amateurs: The Forest City Base Ball Club in 1868,” 46: 2 (June 2008); “‘We Can Beat the Spots Off the Best Club That Ever Lived’: The Forest City Base Ball Club in 1869,” 46: 3 (September 2008); “The Eastern Tour – The 1870 Season of the Forest City Baseball Club,” 47: 3 (September 2009)). Other sources that were of help included coverage of the 1896 Harry Wright Day celebrations in the Rockford Register-Gazette on April 13 and 14, 1896; the reminiscences of Fred Cone (“Baseball Thirty Years Ago,” Lima News, July 15, 1899) and Charles Page (E. C. Bruffey, “Bruffey Tells of Charles T. Page, Atlanta Constitution, August 10, 1919: A4; Atlanta Constitution, March 14, 1909); “Spalding’s Start,” Sporting Life, June 20, 1908, 16; Harriet Spalding, Reminiscences of Harriet I. Spalding (East Orange, New Jersey: PUBLISHER, 1910); Peter Levine, A. G. Spalding and the Rise of Baseball (New York: Oxford University Press, 1909); a history of baseball in Rockford written by James McKee that appeared in Sporting Life on April 9, 1884: 4; Harvey T. Woodruff, “Forest Citys a Noted Team,” Chicago Tribune, March 31, 1912: C2; Adrian C. Anson, A Ball Player’s Career (1900: reprint, Amereon), and William J. Ryczek’s When Johnny Came Sliding Home: The Post-Civil War Baseball Boom, 1865-1870 (Jefferson, North Carolina: McFarland, 1998). Joe Overfield’s profile of Addy in Nineteenth Century Stars, eds. Robert L. Tiemann and Mark Rucker, (Kansas City: Society for American Baseball Research, 1989) was also very valuable. Coverage of Addy’s time in the National Association and National League is mostly based on contemporaneous newspaper accounts and on William J. Ryczek’s Blackguards and Red Stockings: A History of Baseball’s National Association, 1871-1875 (Jefferson, North Carolina: McFarland, 1992). Specific sources are cited in the notes. 1 Chicago Inter-Ocean, April 12, 1896. 2 “Baseball Thirty Years Ago,” Lima News, July 15, 1899. 3 Bismarck Daily Tribune, July 7, 1891. 4 Adrian C. Anson, A Ball Player’s Career, 51. 5 St. Louis Globe-Democrat, April 1, 1877: 7. 6 “Baseball Thirty Years Ago,” Lima News, July 15, 1899. 7 Hartford Courant, July 27, 1886: 2. 8 Sporting Life, September 5, 1908: 7. 9 Rockford Republic, September 6, 1922: 10. 10 Chicago Inter-Ocean, April 12, 1896: 10. 14 A. G. Spalding, America’s National Game, 480. 15 See my A Game of Inches (Chicago: Ivan R. Dee, 2006), volume 1, entry 5.2.1, for an extended discussion of the origins of the slide. 16 Chicago Inter-Ocean, April 12, 1896. 17 A. G. Spalding, America’s National Game, 111. 18 Rockford Republic, May 3, 1922: 1 and 10. 19 George Wright, Record of the Boston Base Ball Club, Since Its Organization: With a Sketch of All Its Players for 1871, 72, 73 and 74, and Other Items of Interest, 15. 20 Adrian C. Anson, A Ball Player’s Career, 51. 21 St. Louis Globe-Democrat, December 12, 1876: 5. 22 Marshall D. Wright, The National Association of Base Ball Players, 1857-1870 (Jefferson, North Carolina: McFarland, 2000), 241. 24 Rockford Republic, August 12, 1922: 9. 25 Winnebago County Chief, April 15, 1869. 26 Rockford Republic, June 21, 1922: 9. 28 Cincinnati Dispatch, quoted in Rockford Republic, June 21, 1922: 9. 29 Rockford Republic, June 21, 1922: 9. 30 Rockford Republic, June 28, 1922: 14. 31 Rockford Republic, August 16, 1922: 10. 32 William Ryczek, Blackguards and Red Stockings, 45-46. 33 Unspecified Philadelphia paper, reprinted in George Wright, Record of the Boston Base Ball Club, Since Its Organization: With a Sketch of All Its Players for 1871, 72, 73 and 74, and Other Items of Interest, 46. 34 Sporting Life, March 24, 1886: 5. 35 New York Clipper, February 21, 1874; William Ryczek, Blackguards and Red Stockings, 117-118. 36 Chicago Tribune, November 22, 1874: 16; Chicago Tribune, December 6, 1874: 2. 37 Philadelphia Times; reprinted in St. Louis Globe-Democrat, June 25, 1886: 5. 38 Adrian C. Anson, A Ball Player’s Career, 51. 39 New York Times, January 30, 1876: 2. 40 Chicago Tribune, February 6, 1876: 12. 41 Chicago Tribune, February 27, 1876: 9. 42 Chicago Tribune, May 11, 1876: 8. 43 Chicago Tribune, July 18, 1876: 5. 44 Chicago Tribune, April 28, 1876: 5; for other instances of Addy sliding, see Chicago Tribune, June 9, 1876: 5, and Chicago Tribune, September 24, 1876: 3. 45 Cincinnati Enquirer; reprinted in St. Louis Globe-Democrat, February 4, 1877: 7. 46 Chicago Tribune, September 17, 1876: 7. 47 Chicago Tribune, September 23, 1876: 6. 48 Chicago Tribune, September 27, 1876: 5. 49 St. Louis Globe-Democrat, November 21, 1876: 5. 50 St. Louis Globe-Democrat, March 18, 1877: 7. 51 Providence Dispatch; quoted in Chicago Tribune, April 22, 1877: 7. 52 Chicago Tribune, June 6, 1877: 2. 53 St. Louis Globe-Democrat, November 11, 1877: 5. 54 Chicago Inter-Ocean, November 17, 1877: 8. 55 New York Times, November 15, 1877: 1. 56 Chicago Inter-Ocean, January 17, 1878: 8. 57 Cincinnati Enquirer, no date, quoted by Joe Overfield in Nineteenth Century Stars. 58 St. Louis Globe-Democrat, April 20, 1879: 10. 59 Sporting Life, August 4, 1886: 5. 60 The Sporting News, April 12, 1890: 5. 61 Salt Lake Herald, September 5, 1899: 3. 62 Deseret Evening News, April 16, 1910: 28. 63 “Face Which Won Arctowski: Portrait of Miss Caroline Addy, Party to the Romance of a Magazine Picture,” Chicago Tribune, December 5, 1900: 7.